Alienware's Area 51m offers outstanding performance from a desktop Core i9 and upgradeable GeForce RTX 2080 GPU. Alienware's Area-51m flagship gaming laptop is big, thick, and fast, a return to form that should reassure people who got worried when the company unveiled the thin-and-light Alienware m15 last year. 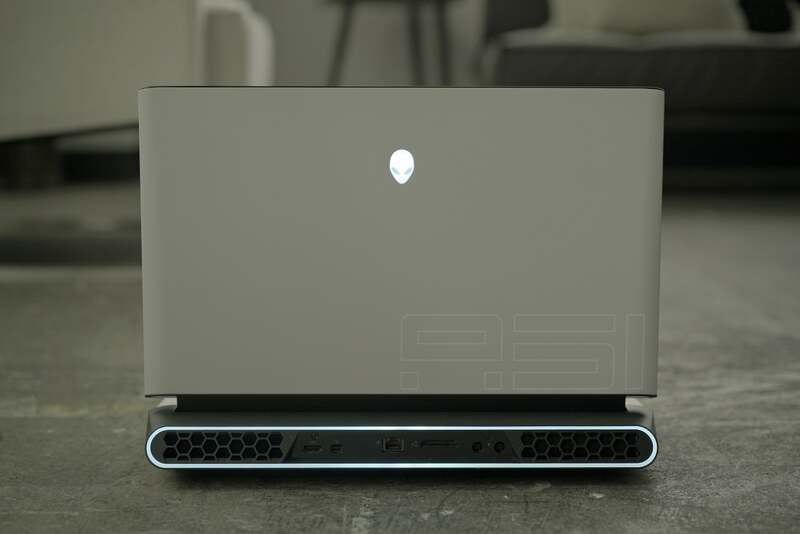 The new Area-51m very well might be the first gaming laptop to bring the Holy Grail of features to consumers: Upgradable graphics and an upgradable CPU. The Area-51m's spec list is all good stuff, and it'll cost you. Our review unit is the highest-end SKU, which starts at $4,050 (available at Dell.com) but is $4,500 as configured below. For slightly more modest budgets, the lowest-end model starts at $1,950 and is nothing to sneeze at. Also note, the white "Lunar Light" color is a $50 upgrade over the dark-gray "Dark Side of the Moon" color. GPU: Nvidia GeForce RTX 2080, in a custom-upgradable version we'll describe further below. RTX 2060 and RTX 2070 are also available. RAM: 32GB DDR4/2400. Other RAM options include 8GB, 32GB, and 64GB. Screen: 17.3-inch FHD (1920x1080) 144Hz Anti-Glare IPS Display with G-Sync and Tobii eyetracking. Other screen options mix-and-match G-Sync or Tobii eyetracking, or drop to a 60Hz refresh rate. Storage: Our review unit carried 512GB of SSD storage using two M.2 NVMe drives, plus a 1TB hard drive. Many other storage options are available. Ports: Two 10Gbps USB-A, one Thunderbolt 3, headset jack, mic jack, full-size HDMI 2.0, miniDisplayPort 1.4, Alienware Amplifier port, 2.5Gb Ethernet, lock port. Power: The Area-51m we reviewed included a 330-watt brick for home use, and a 180-watt brick that's theoretically mobile—lighter than the 330-watt brick, anyway. You can use both power bricks together, or separately, but performance will be affected in the latter case. Yes true believer, the Area 51m is actually smaller and lighter than most of the competition. Area-51m: surprisingly "light" and "small"
If we told you the Area-51m was surprisingly light and small, you'd probably think we'd lost our minds. Naked, the Area-51m tipped our scale at 8 pounds, 15 ounces. 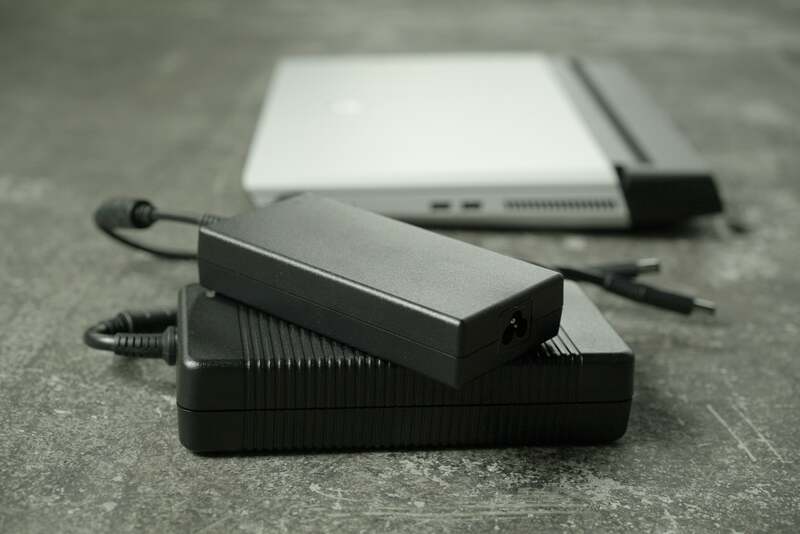 With its two power bricks, it'll take you to 13 pounds, 11 ounces. Considering what's inside of it, it's almost light. We looked around at a few competing 17.3-inch designs: Some of them start at 12 pounds, and with power bricks will top 17 pounds. 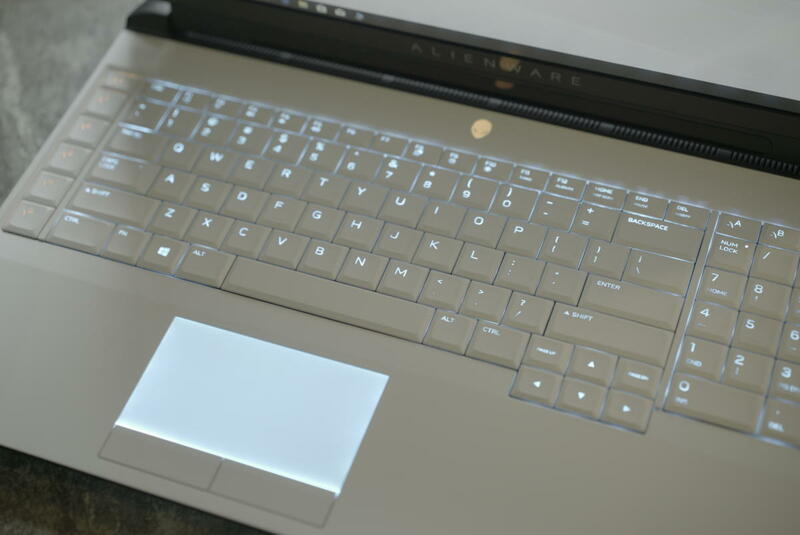 The Area-51m is, in fact, lighter than its predecessor, the Alienware 17 R5. which weighs 9 pounds, 12 ounces. The company said it achieved this by using a mostly magnesium body that allowed it to shift weight from the body to the cooling components. The plastic bottom lid helps, too. You may also be shocked to find that the Area-51m is relatively small, at least in width and height. 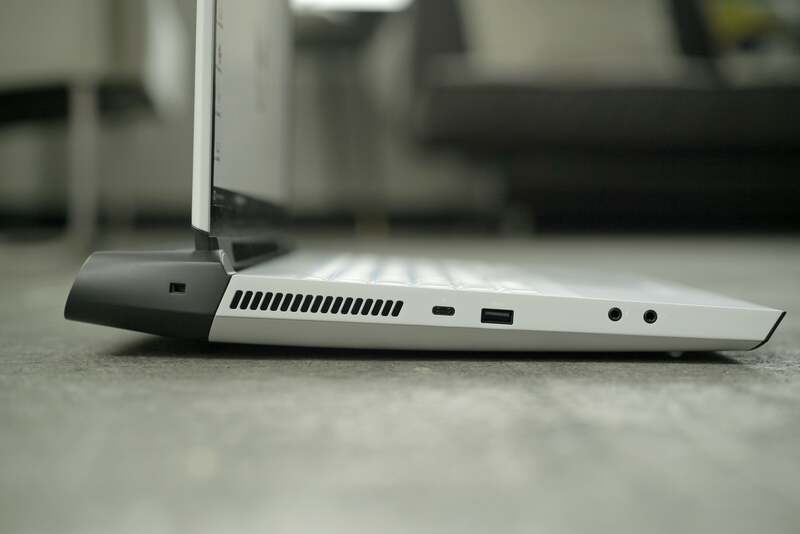 However, it's almost a half-inch deeper than comparable laptops thanks to its signature-Alienware big tuckus. 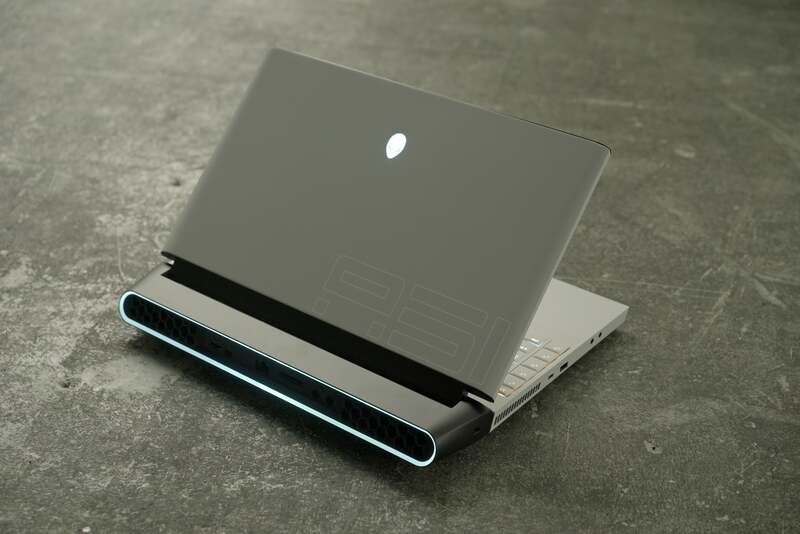 The Area-51m features Thunderbolt 3 along with an Alienware Amplifier port on the rear. 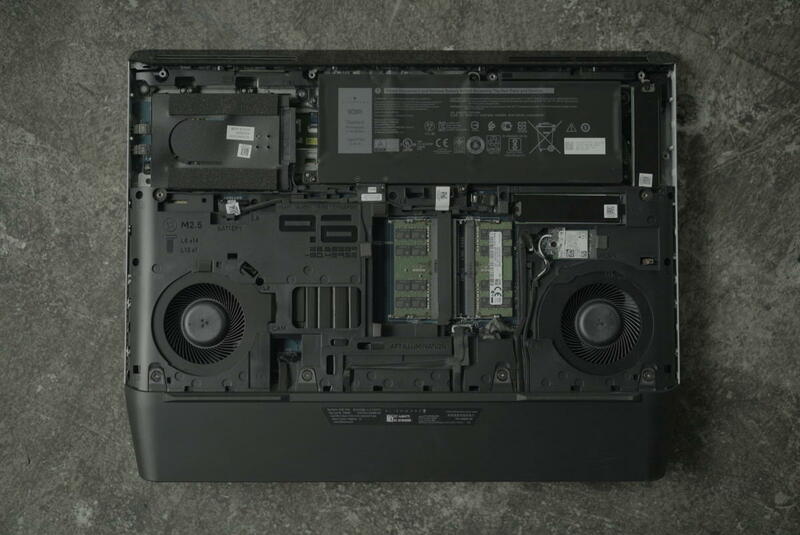 There are two standout features on the Alienware Area-51m: the replaceable desktop CPU, and the replaceable GPU. First, let's get into the socketed CPU and why it matters. Once upon a time, most large gaming laptops used mobile socketed CPUs. Beginning with the 5th-generation Broadwell chips, Intel dumped socketed CPUs for all-mobile CPUs. That meant the ability to swap out the CPU down the road was impossible without also switching the motherboard—which, while technically possible, financially made no sense. With the Area-51m, Alienware taps a standard desktop Core i9-9900K desktop CPU in an LGA1151 socket. What that gets you is 8 cores instead of 6, and and a little more clock speed (5GHz, rather than 4.8GHz) compared to the fastest laptop CPU, the Core i9-8950HK. You can see both CPUs compared here on Intel's ARK. The motherboard of the Alienware Area-51m R1 features four SO-DIMM slots, two M.2 slots, and a standard LGA-1151 socket for the desktop CPU. Because this is a transplant of a desktop CPU, Alienware also pairs it with a desktop Z390 chipset instead of the more common HM370 used in most gaming laptops. Z390 consumes more power than its mobile counterpart but offers far more expansion options, such as additional PCIe lanes and native 10Gbps USB 3.1 Gen 2. A socketed processor typically means user upgrades, and two scenarios make sense. The first is you buy the cheaper Core i7-8700 and upgrade to a Core i9-9900K down the road when they're on fire sale. The other scenario is upgrading to a "10th gen" Core i7 or Core i9. Given Intel's history of dumping sockets or chipsets overboard, however, there's no guarantee you'll be able to do it. That said, the chances that Alienware would do all of this work without offering at least one useful CPU upgrade is very unlikely, because it has deeper insight than we do into what's coming. 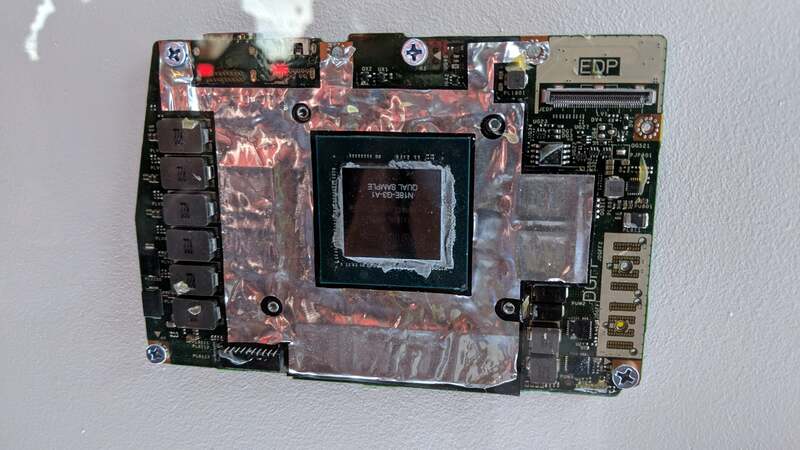 The Holy Grail: Alienware said it designed a custom GPU module that can be replaced down the road with a faster model. The Holy Grail of gaming laptops! The most important component of any gaming PC is the GPU. In a desktop, the easy answer to better graphics is to upgrade to a newer or faster card. With a laptop, you're usually stuck with turning down visual quality settings or resolution until you can no longer stomach it, at which point you buy a new laptop. With the Area-51m, Alienware designed a custom graphics module that—in theory—can be upgraded down the road by the owner. While there have been smaller companies that actively market upgrade paths (Eurocom deserves a shout out here), no major companies have taken this path and succeeded. This Eurocom GeForce GTX 980m uses an MXM form factor and is a pseudo-standard that offers some laptops an upgrade path, sometimes (kinda sorta). Why U No MXM Alienware!? Alienware has taken some flack for the custom design rather than an "off-the-shelf" MXM card but company officials said there's some misunderstanding about MXM—which the company has used before in its laptops. For one thing, Alienware said, Nvidia and AMD no longer support it with reference boards. 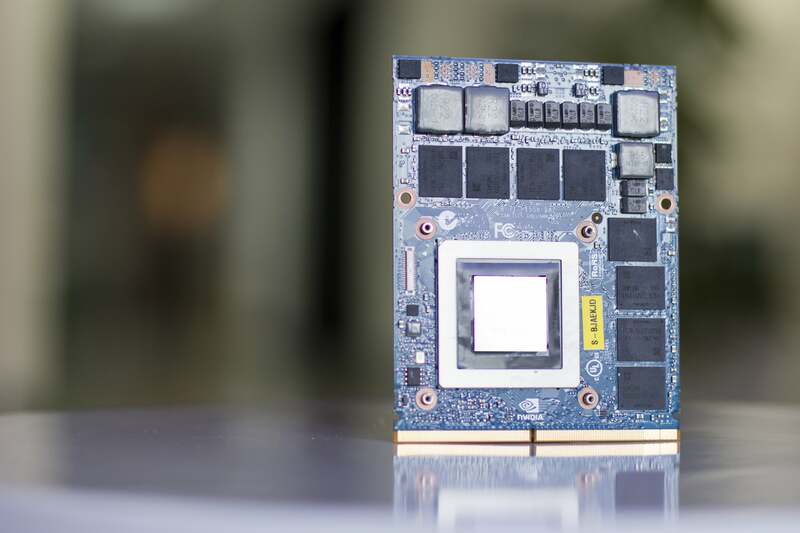 While the spec still exists, each card maker must design, validate and build their own for the latest GPUs. And although people believe all MXM cards to be "the same," they're not, and often are not easily interchangeable either. Faced with basically building custom boards to fit the MXM spec, Alienware reached into the Dell IP parts bin and borrowed the Dell Graphics Form Factor that Dell's workstation group was developing for laptops. 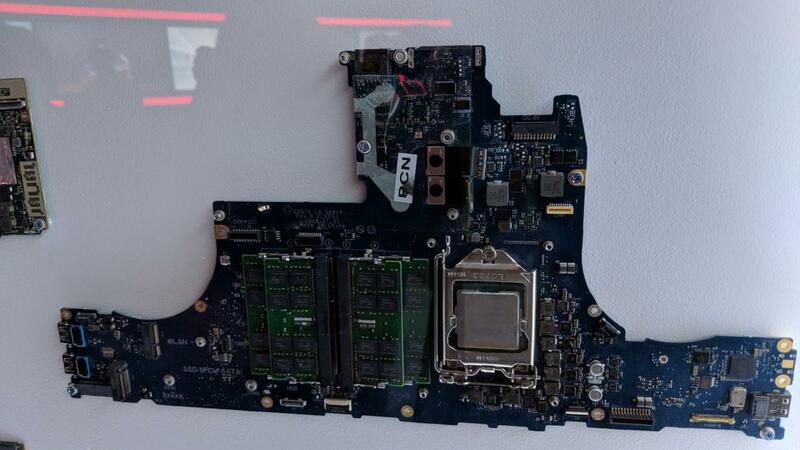 Unlike MXM, which specifies shape and placement of components, the DGFF is looser and allowed Alienware to design a custom card specifically for the Area-51m. 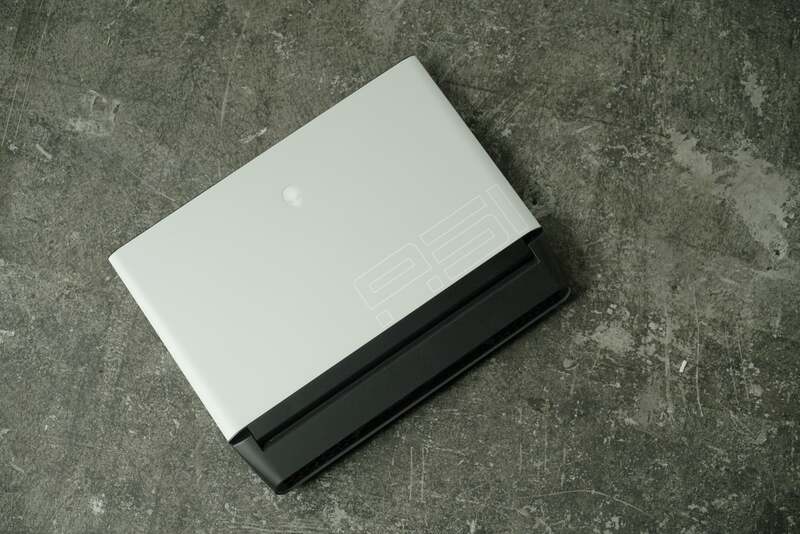 The custom DGFF also allowed Alienware to build a much slimmer design. The company said if it had used MXM, the Area 51m would have been another 4mm or 5mm thicker just based on the connector MXM uses. We have no objections and no issues with the Area-51m's keyboard and trackpad, which are RGB, naturally. If you're seeing the words "proprietary" and "custom" and think it's a play to soak you on any upgrade costs, Dell insists that's not the case. Dell's vision is to drive end-user upgrades as a feature to make people buy its laptops in the first place. If it charged more than competing MXM-based designs, that would drive people away from the laptop, not toward it. It''s not like MXM-based designs are exactly cheap. Canadian laptop company Eurocom is one of the few that actually sells upgrades for its own laptops, along with Clevo, older Alienwares, and MSI laptops. The cost of a GeForce GTX 1080 MXM card? $1,249. The situation isn't any better on eBay.com: We routinely found GTX 1080 MXM cards for $1,100 new and $700 used. There's a real chance future GPUs for the Area 51m will actually be cheaper than their MXM equivalents. Of course, without any actual upgrade GPU kits to compare, we'll reserve judgement. Dell did say its plan for upgrades are still in the works. And yes, if you buy a laptop with a GeForce RTX 2060—the company has plans to offer a GeForce RTX 2070 and GeForce RTX 2080 upgrade for it. Right now though, Alienware hasn't rushed them out because it doesn't think there's much demand for upgrades for a brand-new laptop. With current (and future GPUs) it probably won't be just the GPU that'll need an upgrade. For example, if you buy the GeForce RTX 2060 version, you'll get dual 180-watt power bricks, rather 180- and 330-watt bricks that come with our review unit's RTX 2080. For those buyers, Dell said it plans to bundle the more powerful cooling system (as the existing cooling system has to be removed during the upgrade process anyway) and the required power brick to run the laptop. The company said it expects to have these kits for current GPUs available in two months. TL;DR: Dell will basically include what you need for the upgrade with the kit. Getting to the inside of the Area-51m is fairly easy. You can access the RAM, two M.2 drives and 2.5-inch drive bay once the bottom is off. Alienware officials said unlike some laptop maker's upgrade programs, which require you to send back a laptop to have it upgraded, Alienware's goal is to make it a true customer-based upgrading experience. One day, if the GPU gods are kind, you'll buy a next-generation card from Dell and crack the shell open yourself. The company said upgrading the graphics, GPU, RAM or storage won't void the warranty. Well, at least early on. Alienware said the design of the Area-51m is intended to allow for GPU upgrades. If enough customers brick their laptops doing the upgrade, Dell may have to go to option two: an at-home upgrade service—which will also be offered as an option for those too busy or too cautious to do the upgrade themselves. The company won't know, of course, until enough upgrades are done. Alienware said it planned for a thermal budget of 200 watts for the GPU cooling system. That means any future upgrade, say a GeForce RTX 3080, would have to be within that envelope even to be offered. You get a 180 watt and 330 watt power bricks with the Area 51m. Because no one knows what any next-generation GPU will output in heat, let alone when or what the next-gen GPUs from AMD or nVidia will be, it's a leap of faith of that Alienware's upgrade will even work. That's the main reason previous attempts have failed as well. Asus tried it in 2007 with its C90s, using an MXM module with "at least one" promised upgrade. That upgrade, however, never came, because the next generation of Nvidia laptop graphics only got hotter and more power-hungry. The reason Alienware's Area-51m has a better chance is because laptop GPUs have mostly plateaued in thermals. With the move to a 7nm process from the RTX 2080's 12nm, the smart money is power and thermals should be the same or even better. The 2.5Gb Ethernet, Alienware Amplifier, HDMI and miniDisplayPort are routed out the rear of the Area-51m. Enough with all the features. Keep reading for benchmarks!